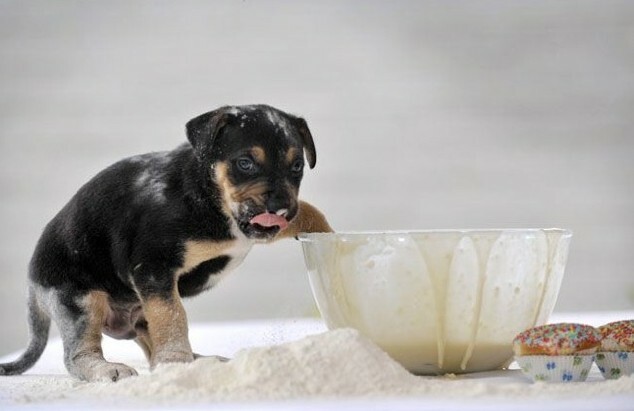 This incredibly easy recipe is tried and true – pups love it. All you will need in plain Greek yogurt and natural peanut butter. These treats keep well for a few weeks in the freezer and should remain cold when you serve them. The steps are superbly simple! Take 1 cup of Greek yogurt and mix well with ½ cup peanut butter until fully mixed. Place the mixture in a plastic bag and cut the end off or use a piping bag to hold your mixture. Line 1 or 2 baking sheets with wax paper, pipe nickel sized dollops of your mixture onto the wax paper in rows. After the baking sheets are full, pop them into the freezer and allow them to freeze completely. Scoop the treats off your wax paper and keep in a plastic container in the freezer. Take a few treats out whenever your pup deserves a refreshing, tasty snack or reward! This entry was posted in Pet Tips and tagged dog snack, dog treat recipe, dog treats, natural dog treats, puppy snack, puppy treat recipe, puppy treats on April 26, 2016 by admin.